By Kori ~ January 19th, 2012. Would you like a quick suggestion for a good wine to drink tonight (or this weekend) that wonâ€™t break your budget and is widely available? Many of our readers have said this is something they would like, so here is this weekâ€™s selection, the 2010 TapeÃ±a Garnacha from Spain. TapeÃ±a Wines, produced by the Ferrer family in Spain, are fresh and fruit-forward. 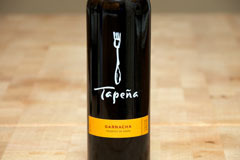 Made to pair well with tapas (small plates), TapeÃ±a wines feature a distinctive fork on the label. At every taberna in Spain, tapas are served communal styleâ€”each person armed with a glass of wine and a fork. Perhaps best known as the owners of Freixenet, the popular sparkling wine, the Ferrer family operates over 11 wineries in Spain. Gabriel Suberviola joined Freixenet in 1980 and has risen to become head winemaker for several of the Ferrersâ€™ wineries. 2010 TapeÃ±a Garnacha (Spain): 100% Garnacha (Grenache). Medium ruby red in color. Aromatic with black cherry and a touch of barnyard on the nose. Fruit-forward with cherry, licorice, and earth on the palate. Medium to full-bodied with lively acidity, medium tannins, and a long finish.